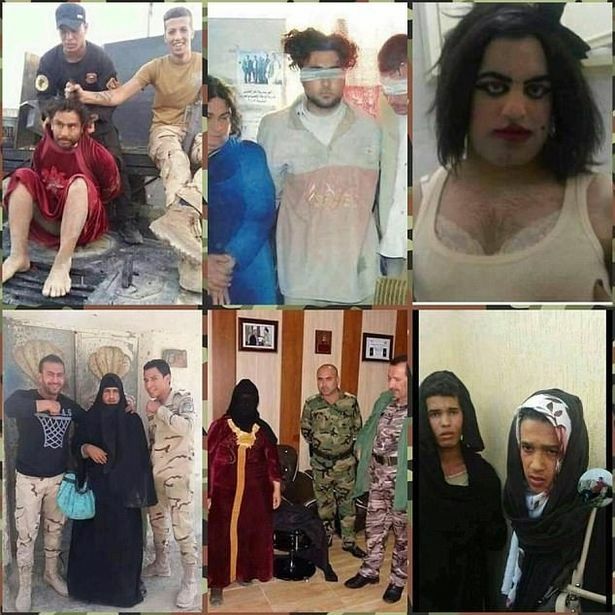 ISIS fighters have dressed up as woman and caked their faces in makeup in a bid to avoid being caught by Iraqi authorities after losing their stronghold in Mosul. 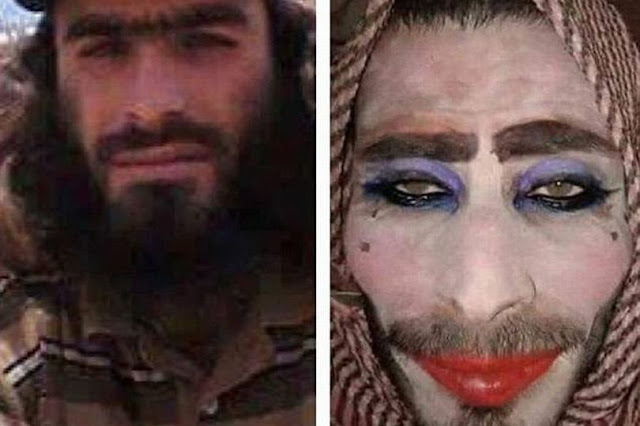 One militant was pictured trying to disguise himself with bright red lipstick, purple eyeshadow, mascara and foundation - but he didn't bother to shave his face. The man had plucked his eyebrows, added beauty spots just under his eyes and put on a headscarf to try to fly under the radar. But he kept his moustache and goatee, making it easy for Iraqi forces to spot him. The picture of the man wearing full makeup was released after he was captured by Iraqi soldiers in Mosul, the Sun reported. An earlier photo showed the man with a full beard, long hair and a unibrow. Another image shows a militant wearing a wig and padded lacy white bra in a bid to fool soldiers into thinking he was a woman. However the man's chest hair was visible just above his bra. These are the lengths ISIS fighters have gone to as they try to avoid being captured after a nine-month battle ended in victory for US-backed Iraqi forces. Other images show militants wearing makeup or women's clothing, with one carrying a blue handbag and another wearing a red velvet number and a beard. The battle of Mosul, ISIS' last stronghold in Iraq, began last October and left thousands dead and more than a million displaced. ISIS, also known as Daesh, had seized the city in 2014 and declared it the capital of its 'caliphate' in Iraq and Syria. Mosul residents said life was miserable under the terror group, who carried out beatings and executions. Mohamad Zuhair, 31, told Reuters: "It was living hell. Daesh denied you everything. "You did not have the right to have a phone or wear jeans. I had to have a long beard." What was it Johnny Depp said about Alice Cooper in Dark Shadows, 2012? UGLIEST WOMAN I EVER SAW! or something like that. Gods, that was a hilarious show. And remember, ISIS is an AMERICAN CREATION. You can buy a lot of black ops with all the money that has 'gone missing' since the day the music died. These guy are still too smart to be hired as US cops.